The phrase a picture paints a thousand words emerged in the USA in the early part of the 20th century. Its introduction is widely attributed to Frederick R. Barnard, who published a piece commending the effectiveness of graphics in advertising with the title “One look is worth a thousand words”, in Printer’s Ink, December 1921. 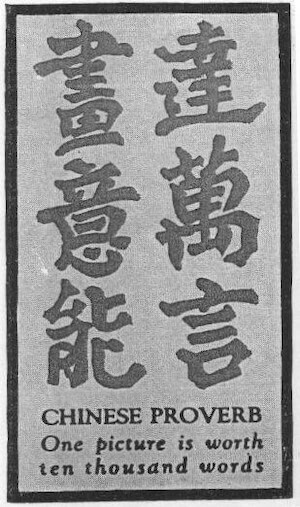 Barnard claimed the source of the phrase to be oriental by adding the text “so said a famous Japanese philosopher, and he was right”. – The Works of Mr. James Thomson, 1802. That tear, good girl, is worth, ten thousand words. – The Trust: A Comedy, in Five Acts, 1808. One fact well understood by observation, and well guided development, is worth a thousand times more than a thousand words. – The American Journal of Education, 1858. The drawing shows me at one glance what might be spread over ten pages in a book. A similar idea was seen very widely in the USA from the early 20th century, in adverts for Doan’s Backache Kidney Pills, which included a picture of a man holding his back and the text “Every picture tells a story”.